“We will be in over 30 States by the end of the year and launching in the UK and Australian in 2016,” says Jim Denoon, co-founder and co-owner of the product. The Drinks Report asked him to tell us more about the vodka’s packaging and concept: “Crystal Head vodka has enjoyed an awful lot of success in the market. Our product is based around another broadly known theme in popular modern culture: that of the little green man from outer space. It’s a well-known notion and I’m pretty sure aliens are affectionately regarded by the masses. Certainly, it’s been very well received so far,” he says. Jim is an engineer with a lot of experience in the design and development of glass packaging. He created the concept and was the creative director in its creation from both a 3D modelling and branding perspective. The glass bottles are made in China. The glass is tinted green and the eyes are made from black tooled aluminium plates that are fixed into the eye-sockets. The 40% abv vodka originates from Iowa corn and is, therefore, 100% gluten free. 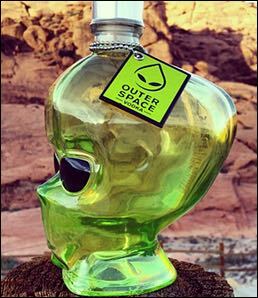 It is five times distilled and, as a final stage of process, is filtered through 4 billion year old meteorites form outerspace. True story, Jim adds. Distributed by Marsalle In the US, the RRP is US$29.99 for the 750ml bottle and US$5.99 for the 50ml. The probable retail prices in the UK will be around £35-40 (70cl) and £5-7 for the miniatures.